Several years ago I started reading a blog called The Common Milkweed. I think I was searching for other nature and garden bloggers and came across Jennifer’s blog—but honestly I can’t remember how I landed on the website—however, I was hooked! Over the years they added in The Common Milkweed Nursery and slowly I began interacting more with comments on the blog—call it my way of making up for the way social media has overridden bloggers—we all miss the comments we used to get on our blogs. 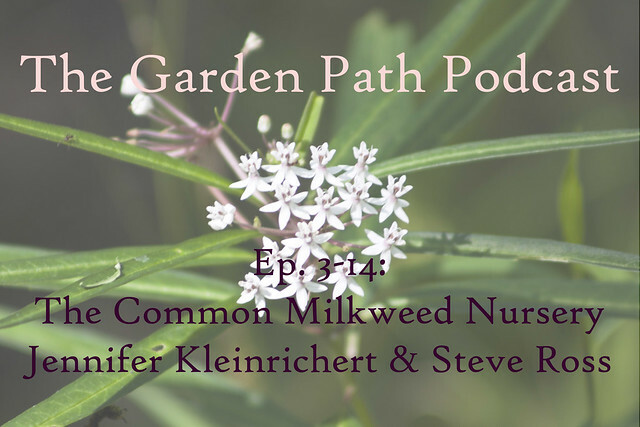 I invited Jennifer and Steve onto the podcast to talk not only about their nursery but also offer some perspective on their ethic for gardening and land management, and to talk a bit about being “nature nuts”. I encourage you to take a deep dive into their blog and soak in some of the things they write about. I often find myself at loss of how to appropriately write how I feel when I’m out hiking and exploring natural spaces and I think Jennifer and Steve are able to express those feelings that I’m not able to put down on this virtual paper we call blogging. It’s a longer episode than usual because I felt they had so much to offer, so please stick with it! You’ll find something interesting out in almost every segment and I definitely came away wanting to dig deeper and be an even better steward of our own property than we already are. If you enjoyed the episode, leave me a comment down below or hop over to iTunes or Stitcher and leave a rating and review! PS: The milkweed in the photo above is Asclepias perennis—not common milkweed. It doesn’t grow in Texas endemically so I don’t have a photo of it! to get 40% off if you order by January 31, 2018 on the publisher’s website. You can also pre-order on Amazon, too! +Jill McSheehy from the Beginner’s Garden Podcast, who was on episode 3-3 has created an online class called The Beginner’s Garden Short Cut for newbie edible gardeners wanting to learn a bit more before diving into their first garden. Jennifer and Steve are my real-life friends. They are every bit as committed, smart, and genuine as they sound.